Liesel, a nine year old girl, with her brother and mother, travels in cold, harsh conditions of Germany, trying to get to Himmel Street. However, her brother does not make it to their foster home as he dies from the coldness. A book lying on top of the snow, The Grave digger’s Handbook, is lifted and carried off in the arms of it’s new owner, Liesel. This is the first book she has stolen. With nothing but a book, Liesel must learn to adapt and survive in her new family. She meets Rosa Hubermann, a very loud mother, and Hans Hubermann, a kind, caring, and always calm father. Liesel’s new foster parents teach her many thing that helps her later on with life. Rudy, Liesel’s best friend, is a boy who does not care about the consequences in life and does what he wants. They are a perfect pair and they do almost everything together from biking to stealing books but, Liesel keeps one dark secret. Max, a Jewish man, is living in the basement of the Hubermanns. During these times, harboring a Jewish person was illegal, very dangerous, and the consequences were severe. However, Liesel and Max become very good friends. Max writes her stories and tells her tales, while Liesel summarizes her day to Max, and Liesel can not imagine life without Max anymore, because he is now a part of Liesel’s family. The book was marvelous, as it brings many different emotions into the story. Moments where everything seems lost, and moments where life is perfect. 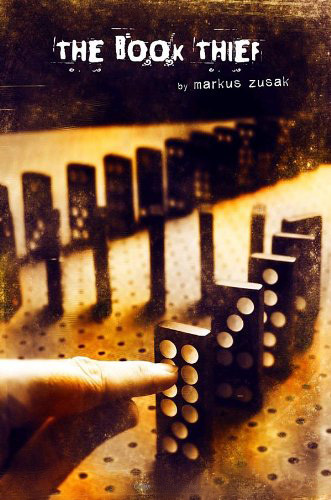 The Book Thief magnifies onto a girl who loses her family but, does not bore the reader like other story. It is a book where she loses everything but, her life starts to slowly build into a life that seems perfect. However, many times, her perfect life flashes in before her eyes. It gets the reader thinking, page after page, what might happen next. The vocabulary and the figurative language is incredible. The book uses hard vocabulary that you might need to use later on. I love the figurative languages used in the book like when Liesel were describing the day as, “The sky is blue today, Max, and there is a big long cloud, and it’s stretched out like a rope.” I would recommend this book for people around the age group of twelve to fifteen as it is a little violent and might be too easy for people who are older. I would definitely read this book again as I enjoyed very much. I give this book ten stars out of ten. 1. What was Liesel’s foster father good at? 2. Why does Liesel keep on having nightmares? 3. Who taught Liesel how to write the alphabet? 4. Who does Liesel write her letters to? 5. Why does Hans Hubermann slap Liesel in the face? 6. How many times did Max and Walter fight? 6a. They fought thirteen times, but Max beat walter three times and Walter beat Max ten times. 7. What is an attribute of Rosa Hubermann? 8. What was the name of the book Max wrote for Liesel? 9. What did Rudy leave behind when Liesel and Rudy were stealing a book? 10. How many medals did Rudy get from the Hitler Youth Carnival? 11. Who’s basement did everyone go to for the air raids? 12. What was Hans Hubermann’s role in the Nazi Army? 13. What was the name of the story Max wrote for Liesel? 14. Why was Hans Hubermann so sad when Reinhold Zucker died? 15. What was the nickname for Liesel after the bombing?